In Russia kvass (russ. 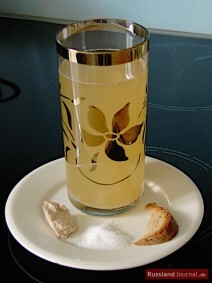 : квас) has been one of the most popular beverages for centuries, and with good reason. Kvass improves digestion and boosts metabolism. It helps prevent infections and keep the heart and circulatory system healthy. Kvass simply makes one feel better as it contains lots of vitamins, free amino acids, micro elements and lactic acid. In the past almost everyone in Russia used to make their own kvass. Monks, farmers, doctors, noblemen and even solders left us plenty of recipes. At that time every sour drink was called kvass. It was brewed of fruit, berries or honey with herbs and spices, and also of bread. When people hear the word “kvass” today they usually think of a bread drink that has a pleasant sour taste and bread flavour. In Russia you can buy bottled kvass in many supermarkets. But homemade kvass tastes completely different. Just try and find out! Cut bread into thin slices. Dry bread slices in a pan without oil or in an oven until dark brown and crisp. Put the bread into a large bowl and pour in boiling water. Cover and leave in a warm place for about 4 hours. Dissolve yeast in some lukewarm water. Add sugar and mix well. Strain bread mixture through a sieve or colander lined with cheesecloth and save the liquid. Stir sugar and yeast into the liquid, cover and leave in a warm place for about 10 hours. Strain kvass through cheesecloth into clean bottles, add a couple of raisins to each bottle, cork and leave in a cool place for 3 days. In Russia kvass (russ. : квас) has been one of the most popular beverages for centuries, and with good reason. Kvass improves digestion and boosts metabolism. It helps prevent infections and keep the heart and circulatory system healthy. Kvass simply makes one feel better as it contains lots of vitamins, free amino acids, micro elements and lactic acid. In the past almost everyone in Russia used to make their own kvass. Monks, farmers, doctors, noblemen and even solders left us plenty of recipes. At that time every sour drink was called kvass. It was brewed of fruit, berries or honey with herbs and spices, and also of bread. When people hear the word “kvass” today they usually think of a bread drink that has a pleasant sour taste and bread flavour. In Russia you can buy bottled kvass in many supermarkets. But homemade kvass tastes completely different. Just try and find out! Recipes for Russian salads, Mushroom Caviar, Russian eggs, etc. Borsch, Solyanka, Shchi and more recipes. Recipes for Russian pancakes (bliny), pelmeni, fish and meat recipes. Shashlik recipes for Caucasian style barbecue. Cabbage – cooking tipps and recipes. Copyright © 2019 RusslandJournal.de. All Rights Reserved.